School is back in session and so is the NFL. Days are getting shorter and temperatures are beginning to drop. All of it heralds the change of seasons as summer slowly edges into fall. Autumn means different things to different people, but there is one constant for color-lovers: Fall means foliage. From South Carolina to Colorado, Connecticut to Ohio, the leaves are beginning to put on their magnificent annual magic show, when they change from green to brown and in the process put on a dramatic display, turning forests across the country into an orange, yellow, and red tableau. Leaf-peepers rejoice, here are 10 favorite spots across the U.S. to check out the fall foliage. Meteorologists in Connecticut are predicting a magnificent fall foliage season this year thanks to solid spring and summer rainfall, as well as moderate temperatures. One of the best places in the state to see the leaves is the small town of Kent. It is home to the scenic Kent Falls State Park, where a series of waterfalls tumble down a rock ridge, which makes a beautiful focal point for fall foliage photos. Pack a picnic and hike up the trail along the brook to the upper falls for a memorable lunch spot. The mountains tumble down to meet the ocean in Camden, a quaint town in Maine’s midcoast region that is rich in heritage, culture and scenic beauty. During the fall foliage season, the mountains blaze crimson and orange, which makes for a stunning sight juxtaposed against the deep blue of the ocean. There are plenty of hikes along the coastline to witness the magic, but Camden Hills State Park offers some of the best views as well as 30 miles of trails. In North Carolina, the area around Winston-Salem is a top spot to watch the leaves change colors. This is because traditionally the leaves keep their bright hues for longer than most other parts of the state – typically through the first two weeks of November. There are a number of places to partake in scenic leaf-peeping drives including Reynolda Mile and the Blue Ridge Parkway from Winston-Salem. Greenville is a food-lovers paradise full of adventures (from moonshine-making classes to cycling trails) that is perfect to visit during peak leaf-peeping season. 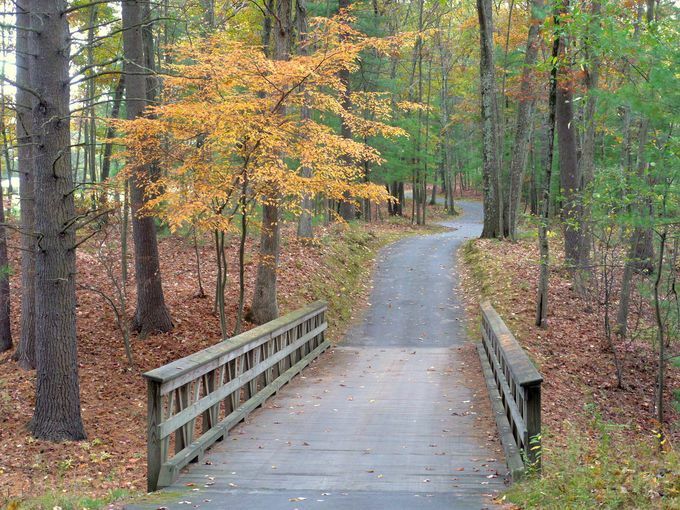 Thanks to its location at the foothills of the Blue Ridge Mountains, visitors can expect moderate temperatures along with brilliant colors in the late fall. Located adjacent to the Great Smoky Mountains National Park, the country’s most visited national park, Sevierville has become a go-to destination for those looking to enjoy East Tennessee’s vibrant and radiant fall colors. Leaves here tend to peak between mid-October and mid-November, and visitors can check them out from a zipline through the fiery-hued forest or from the back of a horse. There are even options to witness the color tableau from above on a scenic helicopter tour of the region. Athens County is a gorgeous area in the foothills of the Appalachian Mountains containing more than one dozen state parks and trails as well as a national park. Adventurists can find solace in the wide variety of trees that blaze with beautiful colors from September to mid-November. Athens visitors can view fall foliage in several ways, including hiking across hundreds of miles in the woods, kayaking in a body of water, or even above the tree tops during a zipline tour. Fall foliagecan also be taken in throughout Southern Ohio while driving, riding or biking through nine different scenic routes that create Ohio’s finest riding experience in Ohio’s Windy 9. Athens is located in Southern Ohio and about an hour and 10 minutes from Columbus, Ohio. If you prefer your leaves set to a snowcapped Rocky Mountain backdrop, then head to Winter Park where the aspen trees put on a dazzling show for a few short weeks in fall. Because of the high altitude, the leaf-peeping season is shorter here than in many parts of the country, but if timed properly is beyond stunning. The contrast of the bright yellow leaves with the purple mountains and snow topped by a sunny, bright blue sky is truly breathtaking. Leaves can be viewed on a number of scenic drives, as well as hikes and bike rides. Early September through mid-November is harvest season in Sonoma County, and there is nothing like tasting award-winning wines at a vineyard while checking out the changing foliage. Wander through the Russian River Valley, where the leaves paint the ground with sun-fire hues and the scent of freshly crushed grapes seasons the air. Vineyards like Paradise Ridge Winery, St. Francis Winery, and Bella Vineyards all offer captivating views along with delectable wines. On the West Coast the Aufderheide Scenic Drive outside Eugene is one of the most impressive fall foliage drives, home not only to an incredible color display of bright yellow and deep blood reds, but also scenic views galore. This entire area from the mighty Willamette National Forest that runs along the McKenzie River in the Cascades Range, to the winding roads like Highway 126 to the Oregon Coast, is full of excellent leaf-peeping opportunities.